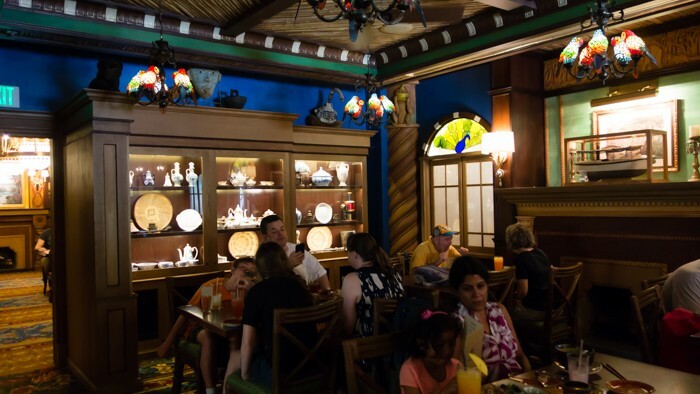 The World Famous Skipper Canteen! 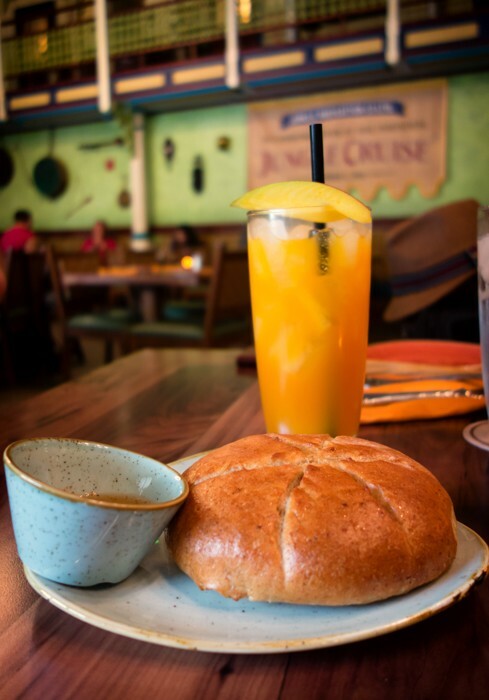 If you’ve ever felt hunger pangs while trekking through a tropical jungle outpost or while traveling niles and niles and niles down a dangerous river, then you know what it’s like to be a skipper in need of sustenance. 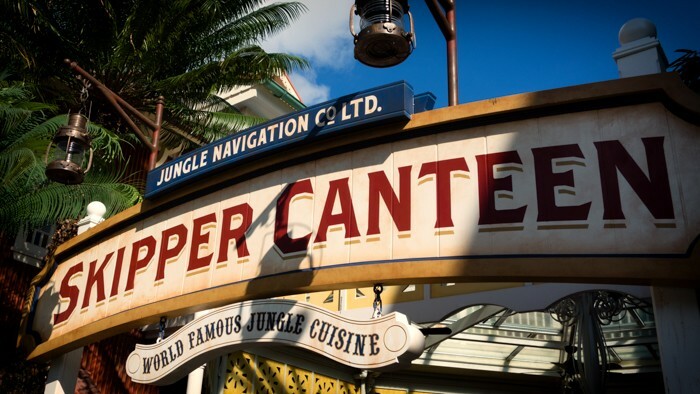 Luckily for you, I’ve got just the place for you to visit the next time you’re in need – the Jungle Navigation Co. Ltd. Skipper Canteen! 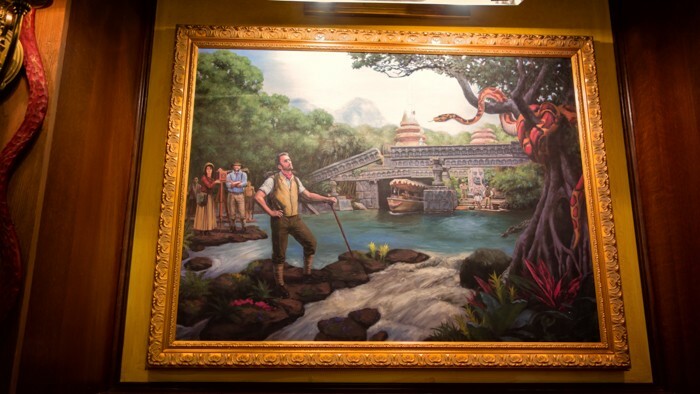 The Skipper Canteen is a new table-service restaurant at the Magic Kingdom inspired by (and thematically connected to) the Jungle Cruise attraction. The skippers who traverse the wild leading guided excursions through the jungle have to have a place to eat, right? 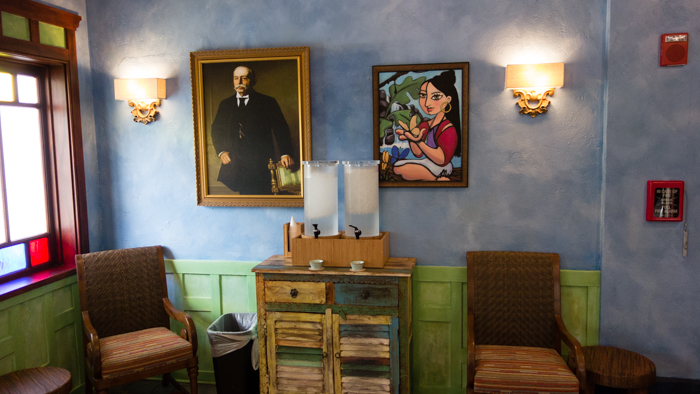 One of the biggest victories from my latest trip to Disney World was the fact that we managed to catch the soft opening of the Skipper Canteen, and I’ve got lots to share! As of the writing of this article, advanced reservations are not yet being accepted for the canteen, but it is expected that they should be available in the near future. We learned of the soft opening simply by walking by the restaurant. Skippers were outside letting people know that the Skipper Canteen was open and they were taking walk-ups. We walked up to the podium and were informed that there would be about a 15 minute wait. We were then offered the option of either taking a pager or giving them a phone number so they could text us when it was our turn. We just opted to take the pager, as we wanted to sit in the waiting area and peruse the menu. We were told to wait in the outdoor waiting section, which had seating that appeared makeshift – crates and boxes and the like. The skippers start hamming it up the moment you arrive. The theming itself was amazing in this little area, and it was taken to the next level by the hilarious skippers working out there. 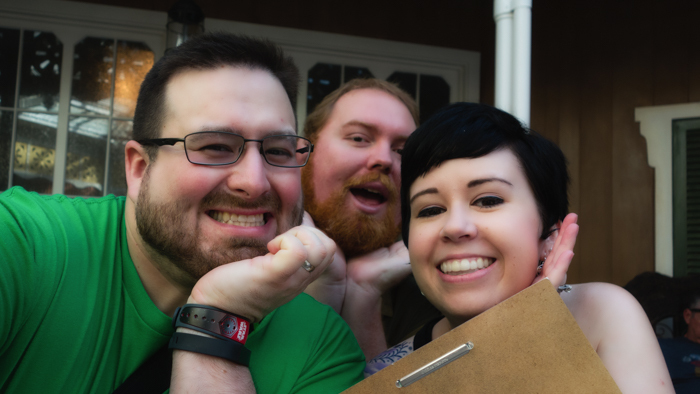 My husband and I were taking a photo of ourselves while waiting, and one of the skippers came running over an insisted that he photobomb it so that we would remember him from our travels. I have to say, there were a lot of skippers working the area outside – at least four. I’d guess that it was because they were in soft opening and were shaking the bugs out, but it seemed odd to have so many people out there. In any case, they offered the chance for amusing interactions while waiting. Our pager went off after about 10 minutes, and we went to the hostess stand just inside the canteen where we were informed that we needed to wait in the indoor waiting area. We gave them our pager and they told us they’d call our name when our table was ready. It seemed a little odd to me to have two stages of waiting, but I don’t know how permanent this is going to be once things are officially up and running. Less than five minutes later our name was called and we were escorted to our table. The indoor secondary waiting area. It was only a minute or two before Skipper Ann, our server for the meal, came over and welcomed us to the Skipper Canteen, asking if we’d ever been there before (had anyone, really?) and doing a Jungle Cruise-esque skipper spiel. She was 100% in character, and it completely worked for her. Anthony and I decided to try the Schweitzer Slush as our beverages, so we placed our drink order and I was off to take photos. 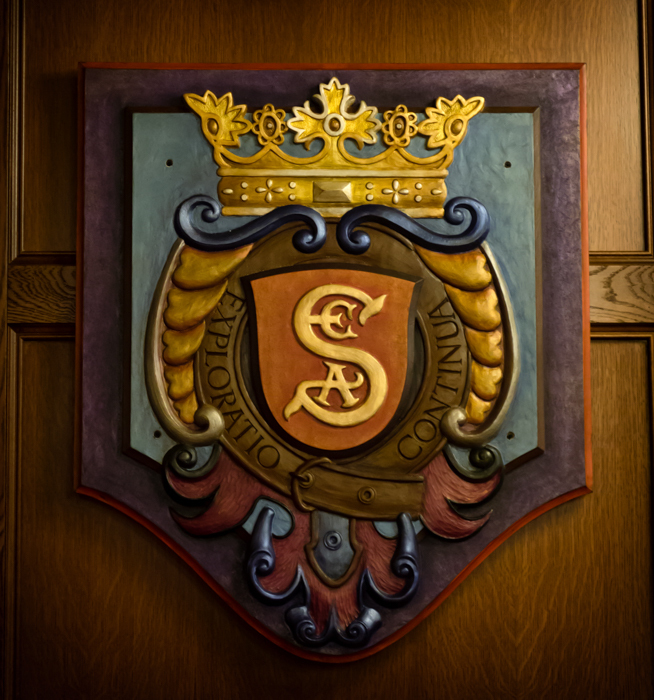 The Society of Explorers and Adventurers! 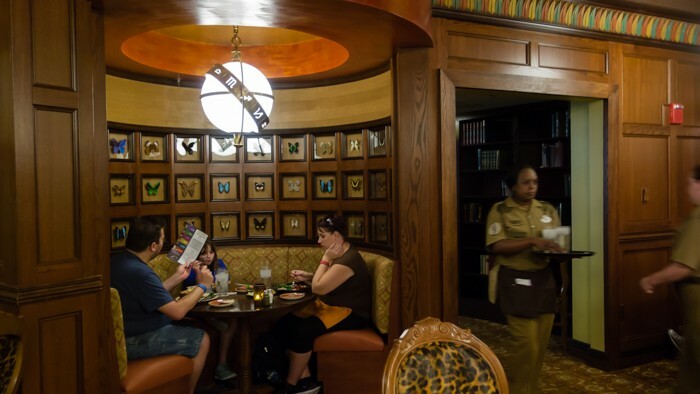 There are three dining rooms in the Skipper Canteen, and we were seated in the crew’s Mess Hall, which was not messy at all, thank you very much. The Jungle Room was much smaller and it is actually the former family parlor for Dr. Albert Falls himself. While I enjoyed the Jungle Room simply because it was much cozier than the Mess Hall, I didn’t see anything there that had a real wow factor going for it. I enjoyed some of the little details that room offered, but it just wasn’t a big draw for me. That cannot be said about the third dining area – the S.E.A. Room! 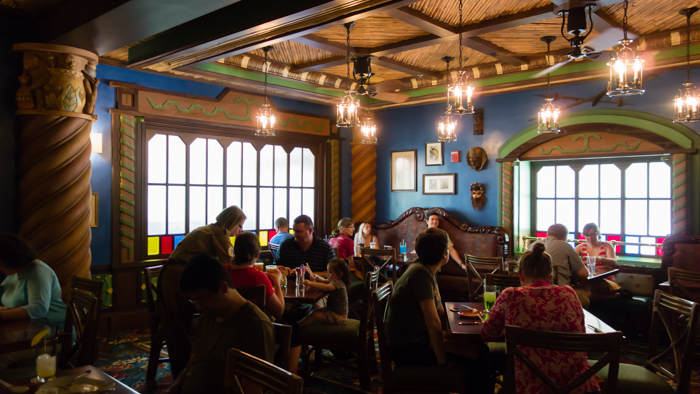 This room was once a secret meeting place for the Society of Explorers and Adventurers, and it was easily the coolest of the three dining areas. The walkway from the Mess Hall to the S.E.A. Room is made to look like the room was once hidden behind a secret bookcase door, and all of the artifacts in the room were unique, particularly the butterfly nook. 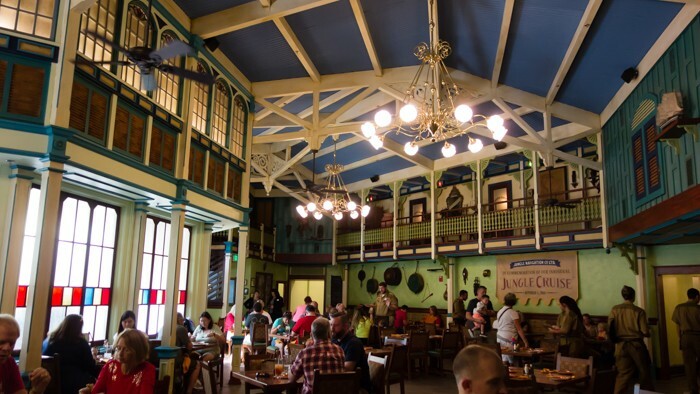 The crew’s Mess Hall – not a bad place to dine. The Jungle Room – much more intimate than the Mess Hall. The Jungle Room – view two. My favorite part of the Jungle Room is the little details. 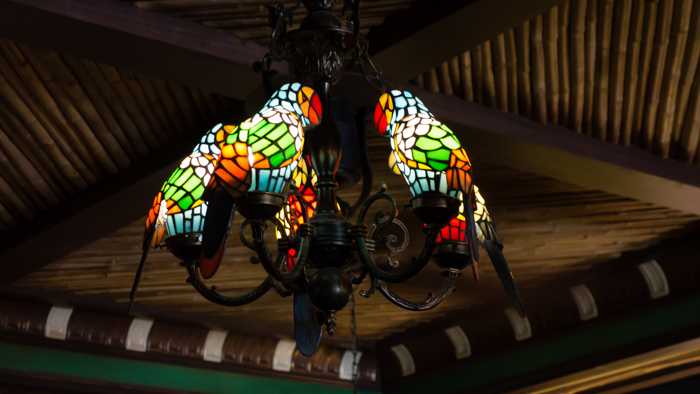 Where can I get a parrot chandelier? 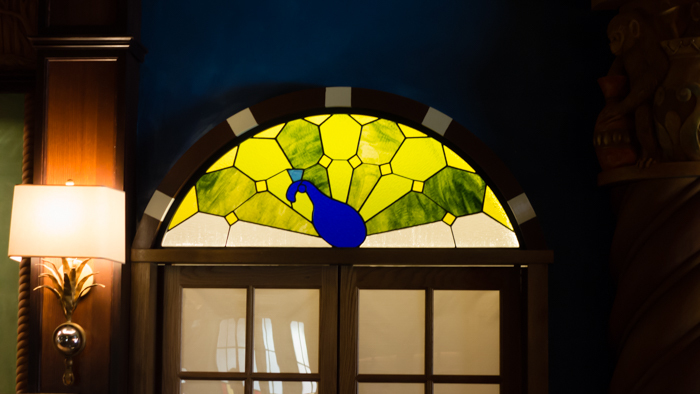 Or a peacock stained glass window? The S.E.A. Room. I’d hold a secret meeting here any day! I really wanted to get a better photo of the butterfly nook, but I think I was already creeping people out with my obsessive photos. Perfect atmosphere for the S.E.A. Room. Punch Line Punch and the bread of deliciousness. By this time I knew my explorations needed to come to an end, so I headed back to the table, hoping to find my Schweitzer Slush but instead finding… Punch Line Punch? The story, according to Anthony, was that the kitchen had run out of Schweitzer Slush and they didn’t have all the ingredients needed to make more at the moment. Skipper Ann had instead brought us Punch Line Punch, and informed Anthony that if the Schweitzer Slush was made at any point during our meal, she’d immediately bring it out. (They never did get a restock on the slush while we were there.) Regardless, the Punch Line Punch was delicious, and it was not a big deal that they’d run out of the other special beverage. I mean, what is a soft opening for if not to work the kinks out of the system? In addition to the drinks, Skipper Ann also brought out some crazy-delicious bread with a seasoned honey dipping sauce. This stuff was to die for, and we ate way too much of it. 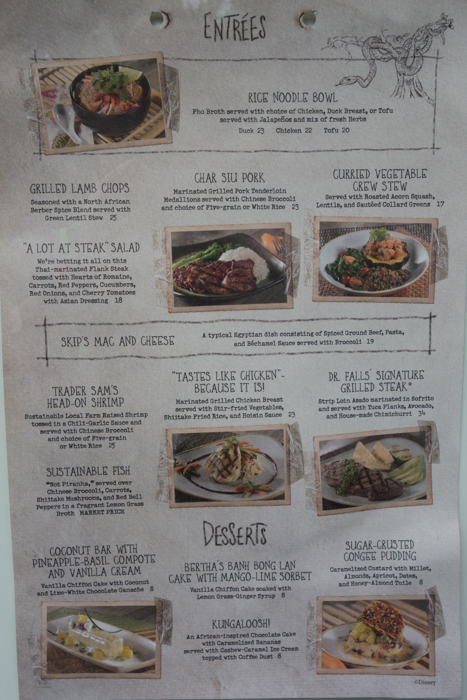 A partial view of the menu. 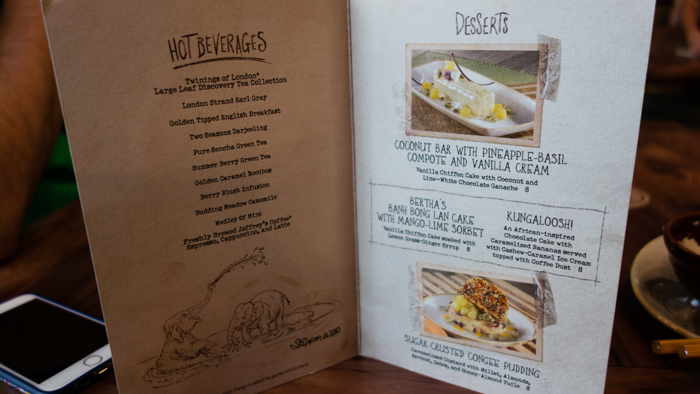 The menu seemed very well rounded to us, with a strong selection of appetizers, entrees, and desserts. 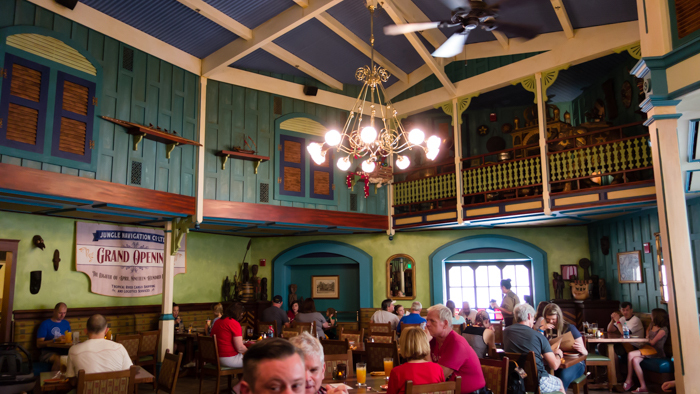 I think I was overly excited to be eating at the canteen, and I somehow managed to not capture clear photos of the entire menu – make sure you check it out on Disney’s official site. We placed our meal order, starting with the S.E.A. Shu Mai appetizer, described in the menu as, “a legendary blend of pork, shrimp, mung beans, and spices wrapped in gyoza skin then steamed.” The appetizer came out pretty quickly, and we were extremely happy with it. The dumplings were hot and fresh and they had a good flavor profile with just the right texture. We devoured them pretty quickly and then we waited for our entrees. S.E.A. 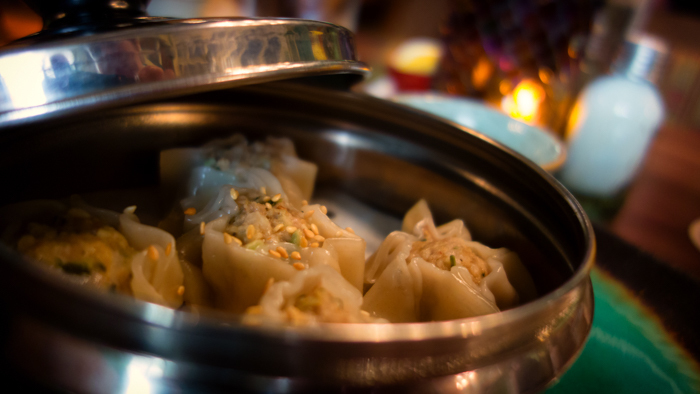 Shu Mai – it was awesome! And we waited. And we waited some more. Skipper Ann checked on us several times after she cleared the appetizer remnants away, but it wasn’t until about the third or fourth time that she showed concern that our food hadn’t come out. It took 40 minutes from the time we had our appetizer to the time our entrees arrived, and I’m not sure exactly what happened. The only time I saw Skipper Ann start to slip out of her character a little bit was when she was trying to track down our food, but I honestly can’t blame her for that. Anthony and I were in a complete state of Zen (I called it the Soft Opening Zen), but I’m fairly certain that a lot of other customers would have started to get testy at this point. Our patience won out, though, and we were finally rewarded with our entrees! And mine had the wrong side. I felt bad for Skipper Ann’s anxiety level, but I let her know they’d brought me the wrong kind of rice and she rectified the situation in record time. I was ready to put that little hiccup behind me and move on the joy of eating my entrée! 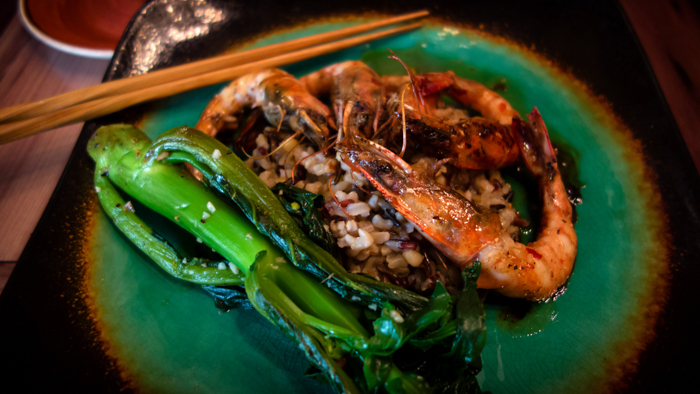 I ordered Trader Sam’s Head-on Shrimp, which is described as, “sustainable local farm-raised shrimp tossed in a chili-garlic sauce and served with Chinese broccoli and choice of five-grain on white rice.” Let me just say that these shrimp were huge. And they were cooked to perfection. Although the food had taken ages to get to us, everything was hot and fresh. I’m also a sucker for Chinese broccoli, and the flavoring was fantastic. I was well-pleased with my food. Anthony ordered the Rice Noodle Bowl with Chicken, described as, “pho broth served with jalapeños with mix of fresh herbs.” Anthony is a sucker for noodle bowls – the man can’t get enough of them – and this one didn’t let him down. He said it was delicious and he switched over to near silence while he quietly devoured the entirety of the bowl. This is always an indicator that something is particularly enjoyable to him! He is, however, a man of few words, so all I got out of him was, “delicious.” It certainly looked appetizing, although I knew that if I tried to sneak a taste I’d probably lose a hand. 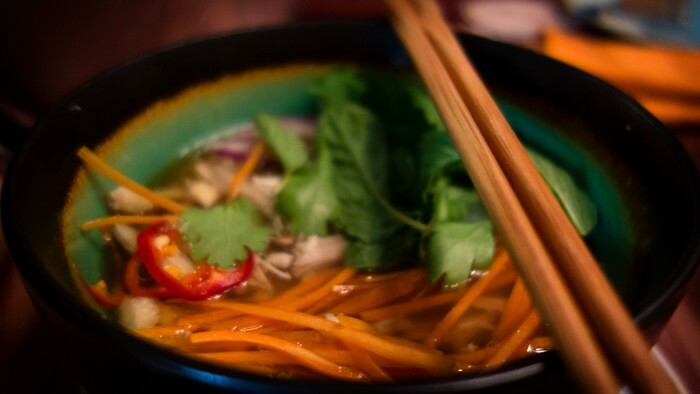 Rice Noodle Bowl with Chicken. We might have skipped desserts, but at least I got a photo of the dessert menu! That counts for something, right? We paid the check (unfortunately the Skipper Canteen does not accept Tables in Wonderland) and headed straight to our own cruise through the jungle. It took about two hours from the time we walked up to the Skipper Canteen for lunch until we were headed back out the door. The overall experience was great, in spite of the things that went wrong. I absolutely attribute the hiccups to the fact that the restaurant was in a soft opening. Our experience gave them the valuable information they needed to make sure that these types of things don’t happen once it is fully operational, and I’m okay with that! 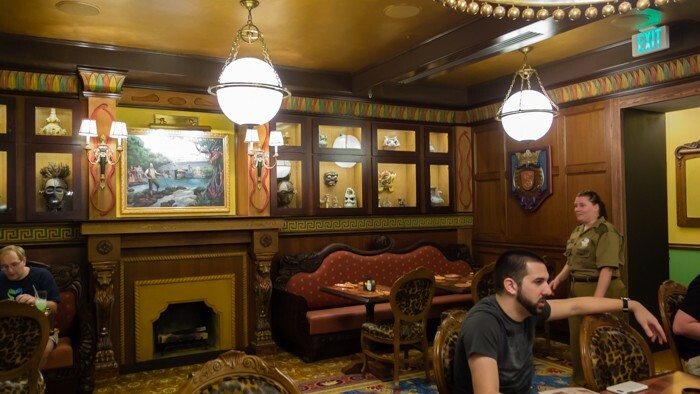 We were thrilled to get a chance to dine at the Skipper Canteen, and I highly recommend that you make an effort to dine there on your next trip to Disney World! 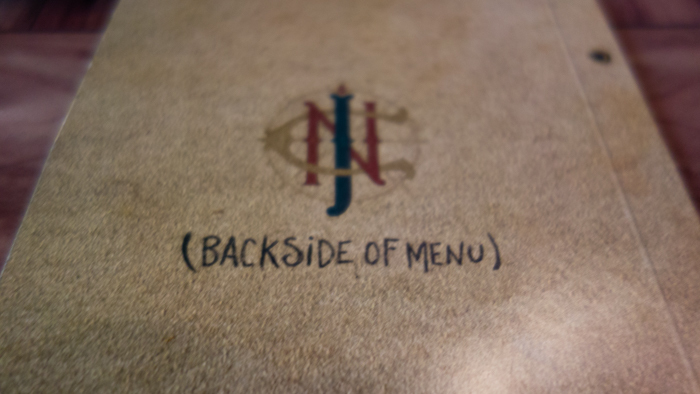 That’s right, it’s the backside of menu. Sounds like they’ve still got some inconsistencies to work out – they accepted my Tables in Wonderland discount when I ate here a couple of weeks ago. We were also able to use our Tables in Wonderland December 14th, day 2 of the soft opening. We really enjoyed our meal here. It was very different to the standard Disney Park fare. The food felt much lighter and tastier than most of what we ate elsewhere. I would be very happy to return. Can’t wait to put our ADRs in! Hopefully we can get them *fingers crossed* because I’ve already chosen my lunch for April 14th~ Falafel aptzr and Lamb Chops. Yum. We were able to eat here on 12-20. We had about a 20 minute wait and we opted for the text because my daughter wanted to work on her Treasures of the Seven Seas while we were waiting. I also had the head on shrimp which were amazing. The bread and honey at the beginning are also so good that I ate too much. I had the Kungaloosh dessert which was pretty good. The banana wasn’t quite as ripe as I’d like, but it was still good, especially the ice cream. My only issue was the kids menu was quite limited and pretty adventurous for most kids. They might need to work on that. My daughter had the steak which was okay. I don’t think most kids are a fan of Chinese broccoli. The 3 kids sitting next to us pretty much cried all the way through their food that their mom made them eat. Even things that kids would normally like, like macaroni and cheese, was very weird at this restaurant.